If you live in Miami’s Little Havana, you may remember a day last summer when you awoke to an aroma decidedly different than the cumin, garlic, and sour orange scents that normally emanate from the lechón asado (roast pork) parlors in this Cuban neighborhood. It was a pork smell, alright, but mingled with the smoke of slow smoldering hickory and apple wood. It was a smell you’d associate with a smokehouse in backwoods Tennessee. 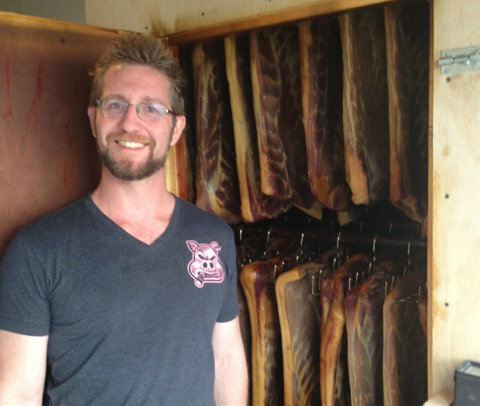 Which was no accident, because when James Bowers and Andres Barrientos decided in 2013 to open Miami Smokers Urban Smokehouse, they studied with smokehouse legend Allan Benton of Benton’s Smoky Mountain Country Hams in Madisonville, Tennessee (population 4,734). The result may be Florida’s least likely food startup—a smokehouse in a city with no smoking tradition, where the local flavor palate looks more to the Caribbean and South America than to the American South. 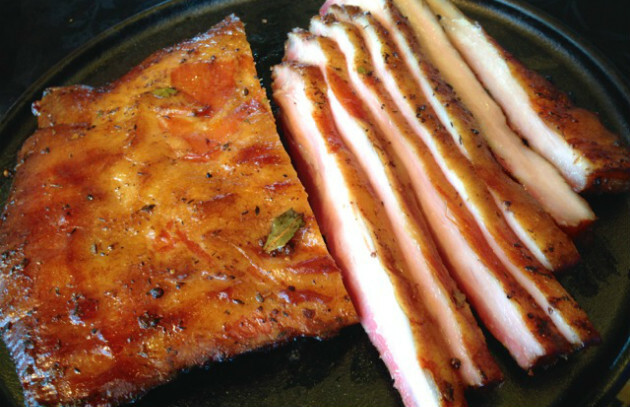 That an Anglo and a Latino—both former chefs—would launch a USDA-approved curing and smoking facility in Miami, specializing in bacon made from Berkshire and Duroc hogs cured with Florida cane sugar and hot peppers, speaks to the full impact of the bacon mania—and heritage meat movement—that throttled up a decade ago and shows no sign of abating. I asked Bowers and Barrientos to walk me through how they make bacon—a process that takes 35 days from start to finish. I also came up with a streamlined version you can cure, dry, and smoke at home in a week. The Miami Smokers start with 10-pound pork bellies from hormone- and antibiotic-free Berkshire and Duroc hogs. (They also make bacon from pork jowls.) They cure the bellies in a mixture of kosher salt, Florida cane sugar, and hot pepper flakes. (They do not use nitrates or nitrites.) They stack the rubbed pork bellies in bins (refrigerated, of course), letting weight and gravity force the seasonings into the meat. (Industrial bacon manufacturers cure pork bellies in a matter of hours using a vacuum injection method.) The curing process lasts two weeks, during which time the salt pulls out moisture and penetrates and flavors the meat. It also increases the salinity, which suppresses bacterial activity. The next step is drying the cured bellies on vertical hooks in a temperature- and humidity-controlled meat locker—a process that takes another two weeks. This air-drying firms the bacon and removes additional moisture. “Without it you get that soft spongy consistency you find in cheap supermarket bacon,” Bowers says. Air-drying also shrinks the meat: By the time the bellies are cured and dried, they’ll lose 30 percent of their original weight. The last step is smoking—done in a giant plywood smoker on wheels Bowers and Barrientos designed and built themselves. 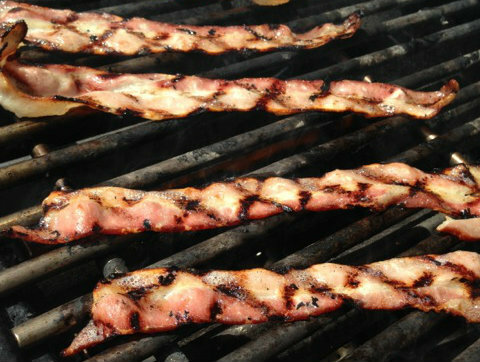 They smoke the bacon for 24 hours using a mixture of hickory, apple, and maple pellets. “The hickory smoke adds strength,” Bowers explains. “The apple and maple add sweetness.” The smoker runs at 110 degrees F—about 20 degrees hotter than traditional cold smoking. “You want enough heat to start rendering the fat,” Bowers says. “This gives our bacon a texture more like lardo (Italian cured fatback) or jamón serrano (Spanish ham) than conventional bacon.” The bacon is hung in the cold room for another five days. The entire process takes five weeks. So here’s my streamlined version—inspired by Urban Smokehouse’s bacon—but with a few twists of my own. I do use curing salt—I like the resulting color and flavor. I also prefer freshly ground black pepper to red. Master this 8-step process, and you’ll make bacon like a pro.